So I thought maybe a change would be good? For my next layout I'll have much more space (well, once I've cleared out a huge built-in cupboard, dismantled it, redone the flooring, decorated the room etc. - not to mention decided how to dispose of my current layout - so its not exactly imminent!) so I started mapping out what I could achieve in 00 gauge. I want a continuous run, but only have about 3 feet depth (plenty of length). So I ran into all the predictable 00 issues = unrealistic tight curves, only being able to run short trains, trying hard to disguise the 'train-set' look . . . No, 00 is not for me, sorry. So I planned out what I could achieve in N. Double track, long trains, sweeping curves - so much better than 00 - only I knew my frustrations above would still be there. What to do? huge scale where you can actually see everything! Hmmm, this sounded like it may challenge my second frustration above = to achieve good reliable running! But of course I am a DCC convert and am aware that a decent decoder can improve the quality of slow running. I also am vaguely aware of the concept of 'stay alive' modules (though they were always far too big for my N gauge locos). More research showed that the 'Rolls Royce' solution for this is the Lenz 'Gold' decoder with a 'Power-1' stay alive. 1. Use of very high performance capacitors to reduce the size. 2. Use of low voltage capacitors to unsure maximum charge can be achieved. 3. 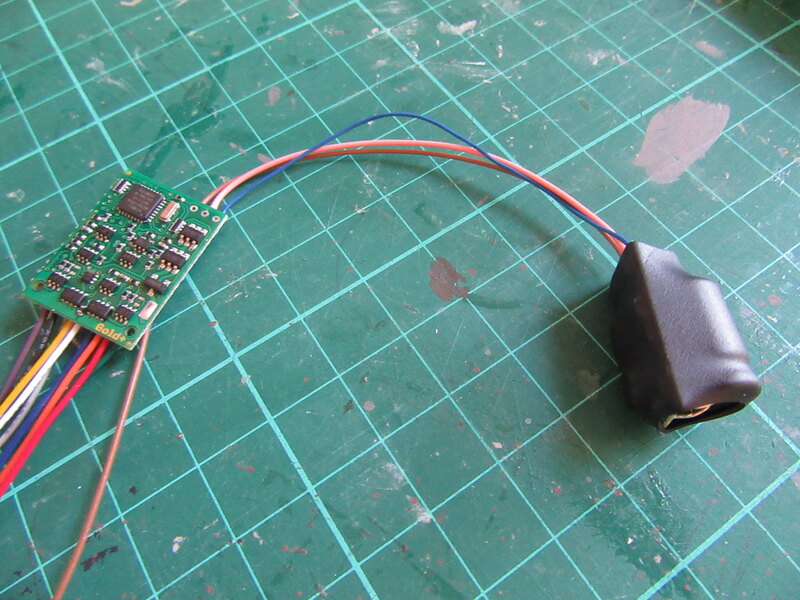 A DC-DC converter to get all the power out of the capacitor. 4. Comparator input circuit to amplify a miniscule DCC signal to something readable. The amount of increase in performance of all of this is huge, (1) gives you a 200%-300% improvement, (2) gives you a 75% improvement, (3) gives another 300%-400%, and (4) allows you to drive the train. Take all of this in to account and the Lenz solution is equivalent to having a capacitor twenty five times the size of the simple solution used by the other manufacturers. With my hands in my mouth I placed the loco on my test track and connected to my DCC controller. It runs - yay! But not only that, it runs for several seconds when no contact with the track! But not only that, it receives DCC instructions whilst not in contact with the track! 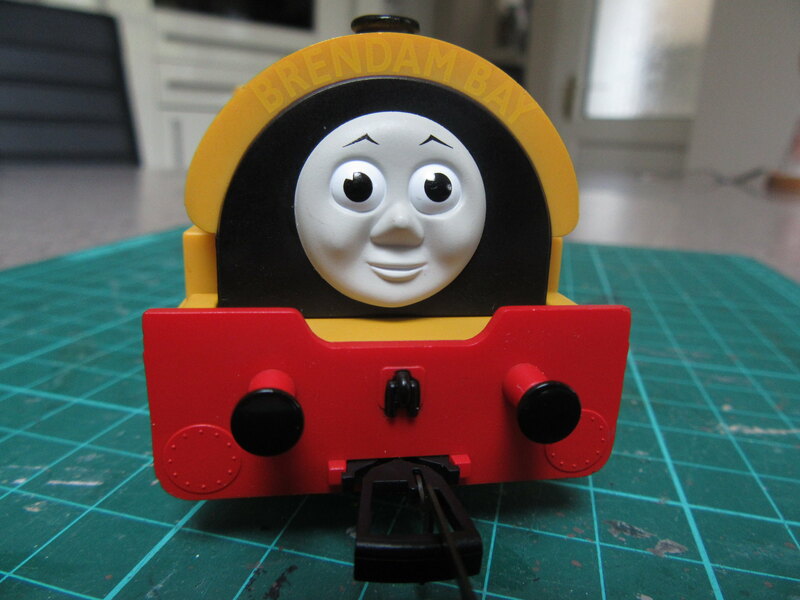 So, to continue my experiment with 0-16.5, I have now ordered a 'Mars' Smallbrook kit to convert my Bill into a Peckett style Saddle tank in 7mm:ft scale, in which I am hoping to hide the electronics! The arrival of this kit is now eagerly awaited (!) though I am away over half term so may not be able to continue with this for a short while . . . Sorry for such a long post (did anyone reach the end of it?)! I did!!! Great stuff.. I've contemplated this scale for my garden... Mainly so i can butcher some OO locos!! I've run narrow gauge 16.5 mm in the garden, with no insuperable problems. One odd one: Peco track and points were adequately UV resistant, except for the point tie-bar. Once noticed a primer and a coat of thick paint prevented further deterioration. 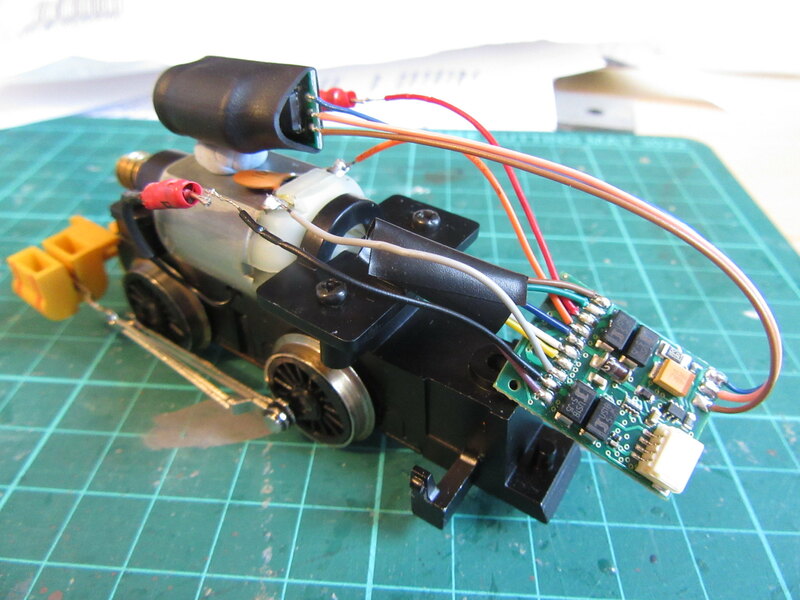 Among the last of my OO battery loco experiments were three with (cheap, both ways) 2.4 GHZ R/C and 3.7 volt batteries. I haven't checked yet to see what the reliable range is, or the duration of the batteries when loco is pulling a load. Both *might* be good enough to side-step track power issues completely, depending on length of trains and length of layout. Thats a great write up PNP, yes read it all, a subject I am very aware of and intend to follow, I need asymmetric braking and have always therefore been looking at lenz and zimo, Gold being the rolls royce, and for one or two trains, the cost is not important. Trouble is, I have 50 locos, so I think I will have to investigate home made caps and maybe Lenze Silver or Zimo. Still, yours is very impressive, just wish I could afford that set up for all! TimberSurf wrote: just wish I could afford that set up for all! Yes agreed it would be a small fortune for 50 locos . If I build up a small collection gradually though, it'll hopefully be affordable . . .
Then I thought about 0-16.5 (this is 0 scale 7mm:ft narrow gauge running on 16.5mm gauge track) [list][*]huge scale where you can actually see everything! I have changed to this scale and gauge and I've been very happy with it. I have found it has large advantages over for me. The largest advantage is that it is so much cheaper to model in. 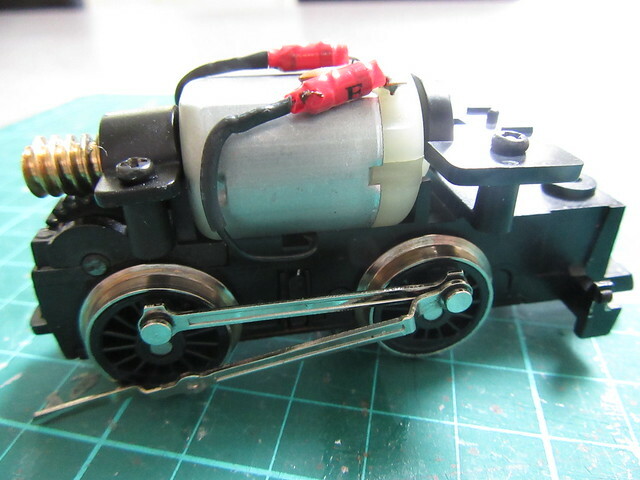 I did fit a tiny Lenz decoder in my loco No.1 (As I have athe Lenz system for my 00 gauge collection) but I felt it was better to stay with good old DC, especially because I'm on a budget. I have made wagons for less then £1 each but I've found it better to aim at £1.50-£2 each to allow for better wheels. I make couplings from drawings pins and paperclips mounted centrally they allow me to run trains in tight radius corners. I'm building a layout with an oval of line being on a 2ft wide board. I've found things so much easier to build and paint in this scale, and the real joy is that everything you build has character. I didnt want to confine myself to copying a specific railway as I like to build my own railway as I'm enjoying the freedom this brings. The green loco is a Smallbrook Studio "Clio" kit (With added coal bunkers) mounted on a modified and rebuilt Triang 0-4-0 frame with modern Smokey Joe type running gear and motor. Notice the home made coupling used. The black loco is a simple RTR bashed Smokey Joe type loco. It is not quite finished yet as I've not fitted buffer couplings to it, though I've extended the bufferbeams ready to accept them. Last edited by Mountain on Sun Oct 15, 2017 10:14 pm, edited 1 time in total. I will add that with most narrow gauge lines they were fortunate if they had more then one loco. Most small lines used a horse! Narrow gauge was used in many small industries from quarries to mines to factories. One of the well known narrow gauge operators was the MOD, which operated steam, diesel, petrol, fireless steam and battery propulsion in various environments. Some MOD lines used human propulsion. The interesting buildings and tunnels add to the interest. Steam locomotives had spark arresters usually to the "Neath" design which visually took the form of a wider portion at the base of the chimney. They would burn liquid fuels like oil, kerosene etc. Even crude oil and tar were tried. Coal or wood was not used as it would provide an exposed flame, not safe for the MOD environment. Narrow gauge for use with slate and other materials would usually be in two ton or three ton waggons which were small, and relatively simple to scratchbuild. It is a scale that I think I will eventually move too, but I have a ton of 00 stuff at the moment. I saw the pictures and thought "I have one of those!" Well, not quite. The waggon was scratchbuilt from Peco code 100 rail and baked bean tin. Wheels were bought secondhand where I assume they came from USA H0 freight cars. The loco is one I've kept ready for conversion. 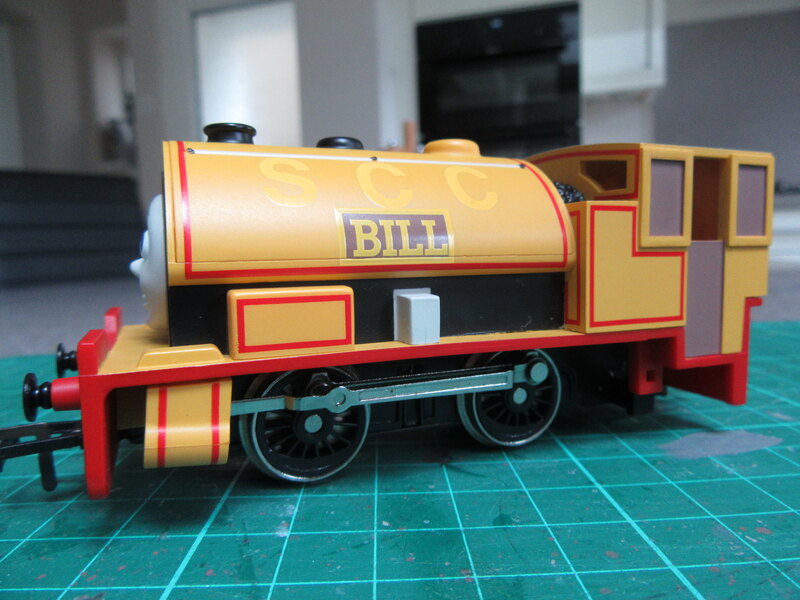 After mentioning the possibilities of converting a Small brook Studio kit to use with this loco, Mike Raynor from Small brook Studio then made a kit to convert the loco. I've not bought one myself as yet as funds have been tight, hence why my donor loco is still waiting! 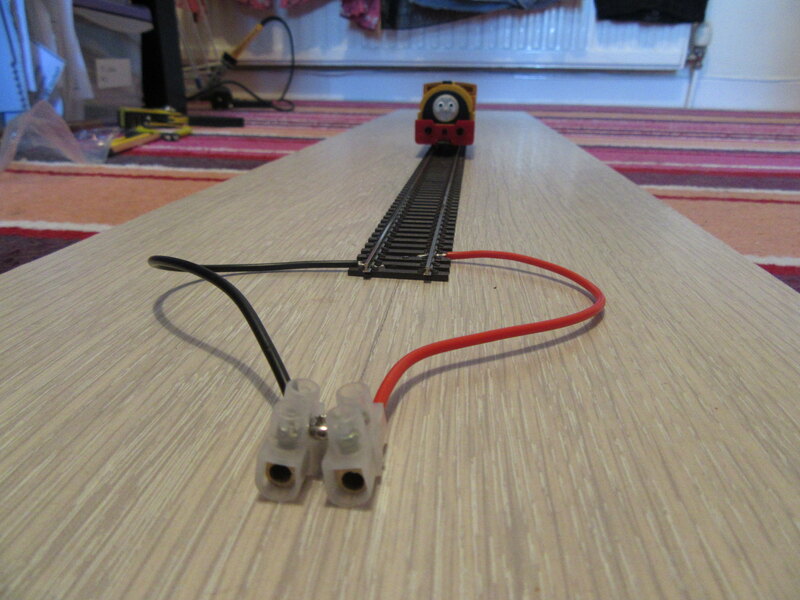 The odd looking track I made from curring PCB board for sleepers and the rails are made from metal from a biscuit tin. (I just wanted to explore the possibilities of making my own track). I use it for display or photograph purposes. button but delete the rest of the of the quote. then make your comments after the [/quote] tag. PNP actually apologised for the length of the post, it's equally daunting in its quoted form. OK lets get back to playing trains and having fun. Sorry Buffer stop. Not sure how to delete quickly on this tablet. Will just stick to the reply button if quote looks long. Mountain wrote: the real joy is that everything you build has character. I didnt want to confine myself to copying a specific railway as I like to build my own railway as I'm enjoying the freedom this brings. Mountain wrote: Sorry Buffer stop. Not sure how to delete quickly on this tablet. Will just stick to the reply button if quote looks long. I think you can just edit your post and remove the quoted section if you want . . . I make my own nameplates using aluminium fizzy drinks can cut to feed through one of those old label printing devices for sticky back plastic lables that were popular before the days of the internet and computers took off. Re the name plates, the original Dymo? It's doing well if it still punches a clearly shaped letter, particularly through an old drinks can. My Stationery Office standard issue one was kn******d by the time I left, so I didn't bother forgetting to hand it in. When I was even younger (some say during the ice age) there were penny in the slot machines that did a much better job on a strip of zinc, they even did decorative curly bits for the ends. The older ones just put a dimple in the middle of the curly bit, but others had an alternative that punched it through to make a screw hole. Lovely piece of Victorian engineering, wonder if any survived. Is these thingies. I've had the red one since the mid to late 1980's. The white one is one I recently came across which came from my grandad things. They are made from plastic, but as aluminium drinks can is soft and thin I've had them working OK with it. Sometimes it takes two or three attempts, but as the cans are free, it doesn't matter if they dont always print straight.